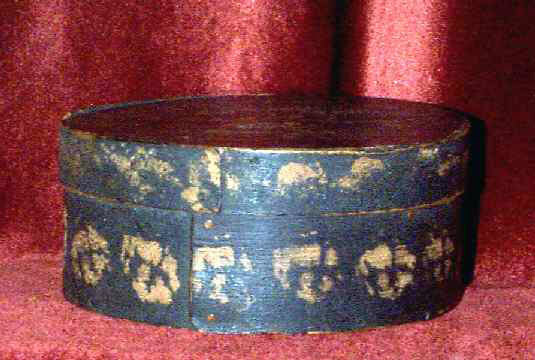 Fine little sponged decorated pantry box in old black paint. Construction is wooden pegs and copper tacks. The sponging is light tan on the old black. There is an impressed mark on the top of the box that is mostly illegible but I can read "Mass." and also something that looks like "Mason" as the second name of the maker. The town name appears to begin with a "W" and ends in "TON". The condition of the box is excellent with only a tiny sliver of loss in one 1" area of the top rim. Wear is appropriate to the box's age and use. Size is 6 1/2" in diameter and 2 3/4" tall.